If you walk through any major city across the world, you’ll most likely see women dressed in the latest fashions with the most expensive accessories. The well-trained eye can spot them a half a block away, carrying that rare designer handbag that costs as much as a car or sauntering along wearing a pair of red-lacquered sole shoes. Wearing fashionable accessories like these carries a certain cachet and silently informs the world that you’re financially successful. While this sounds like a twenty first century concept, in reality, it isn’t. Women throughout history have been using fashion and beauty accessories to announce their status in society. Only back then, many of these items would have been kept at home, displayed on or near a dressing table where visiting guests would see them. 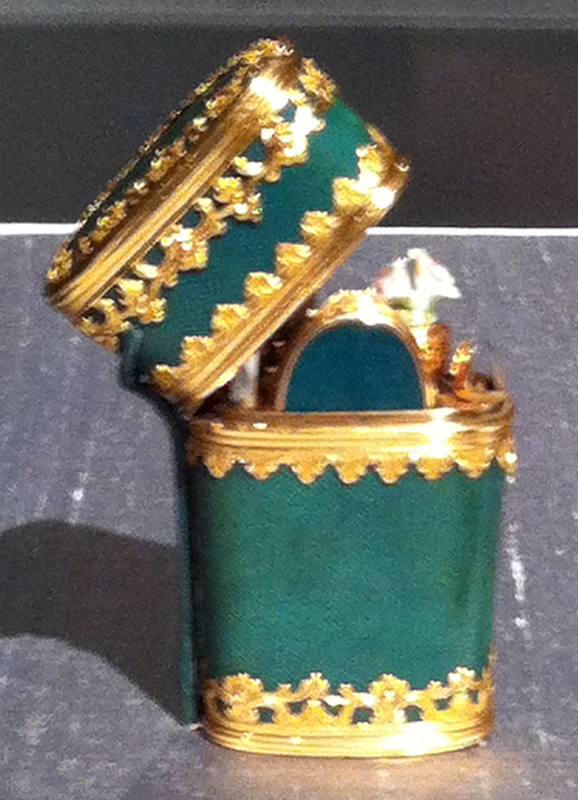 I recently attended the “Vanities: Art of the Dressing Table” exhibition at the Metropolitan Museum of Art and thought you might be interested in seeing some of the lovely accessories they had on display. 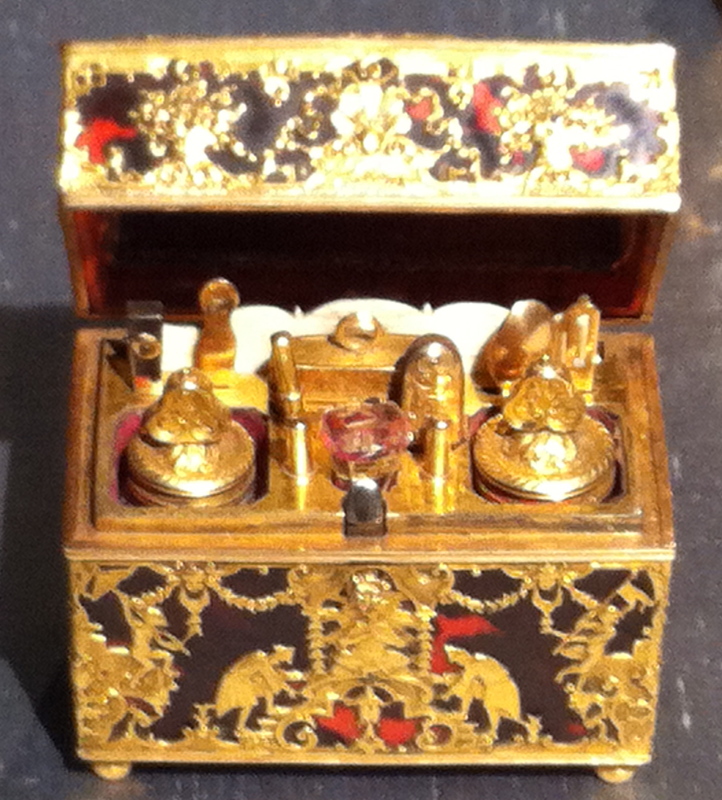 During the Renaissance, containers in various sizes and shapes were used store an array of beauty items. These containers were either laid out on a table that was designed solely for the toilette or one that was multifunctional. This is how the cosmetic box slowly gave way to the dressing table. 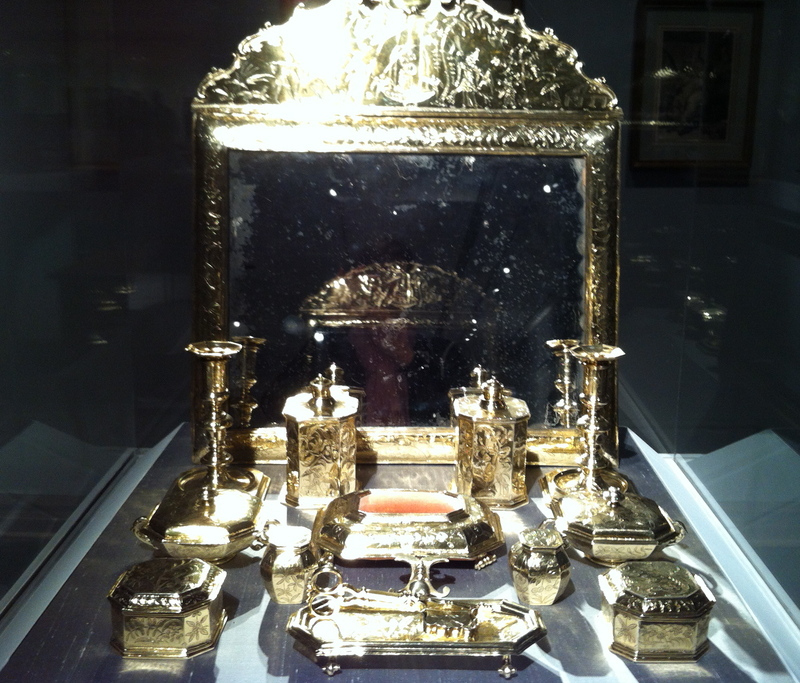 The British toilet service pictured above is ca.1683 and is made of gilt silver and glass. The various items are decorated with chinoiserie scenes, which were popular at the time. This set would have been displayed in an aristocratic lady’s bedroom or in a smaller connecting room. I thought this item was fun. It’s a wig cabinet, ca. 1685. 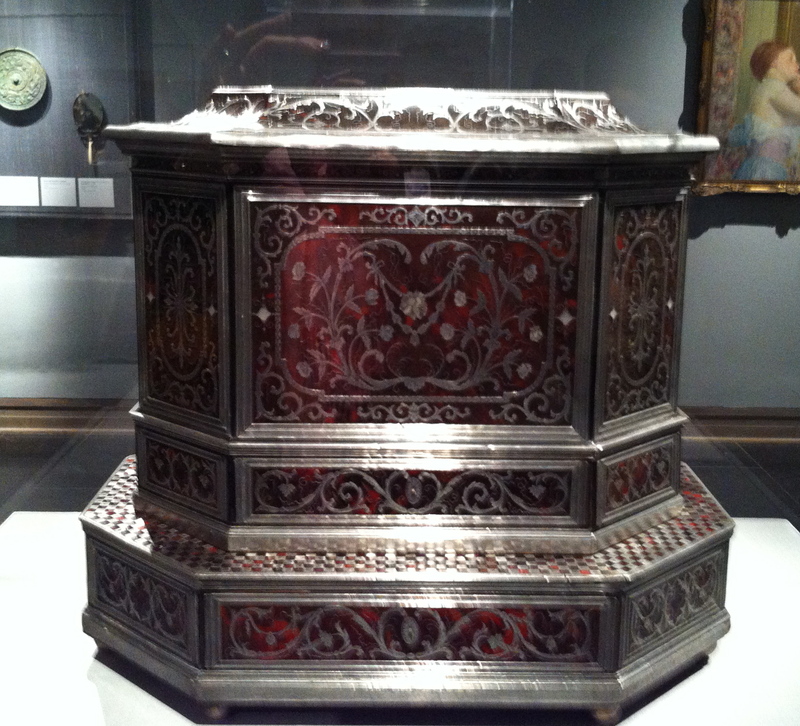 After Louis XIII began to wear a wig in 1624, elaborate cabinets were made to store and protect these hairpieces. This cabinet is embellished with marquetry of pewter and mother-of-pearl on horn over paint, simulating tortoiseshell. It contains drawers for combs, brushes, perfumed powder, powder bag, and pins. 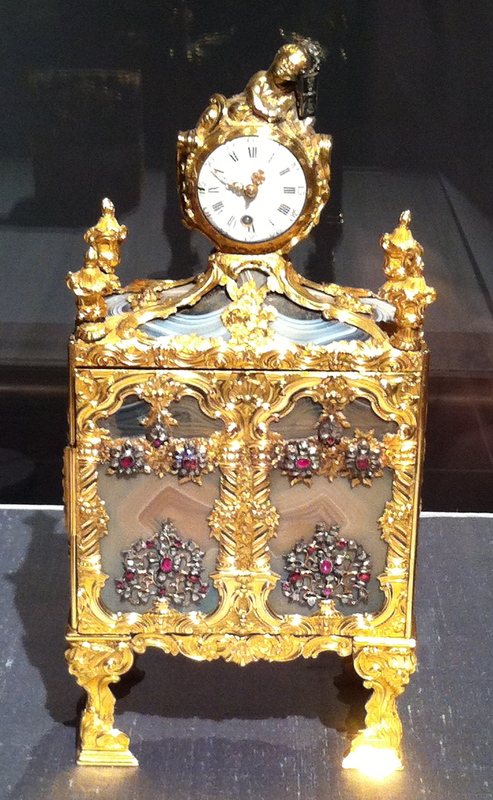 This German nécessaire dates from 1700-1725 and is made of wood, tortoiseshell, gold, glass, and ivory. This nécessaire is one of a pair made by the British craftsman John Barbot around1760. 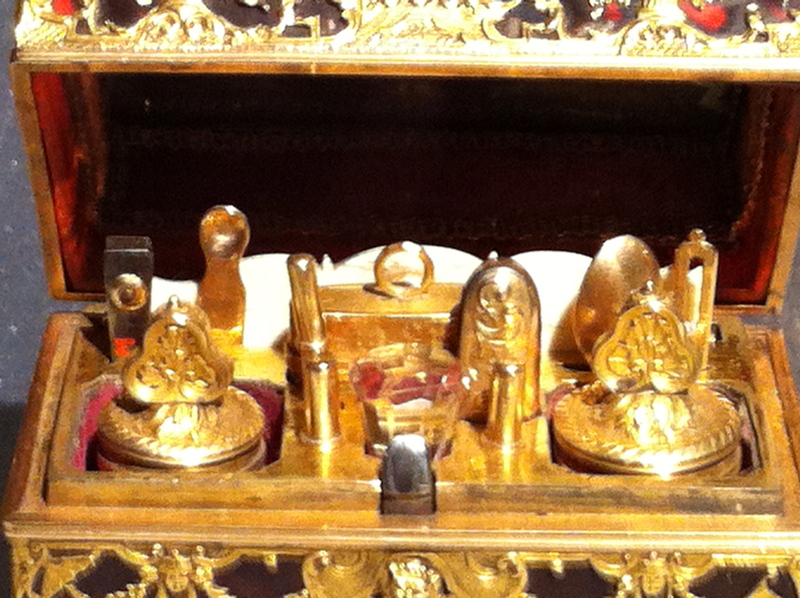 It is made of gold, agate, diamonds, rubies, wood with gold piqué ornaments; and gilt-brass mounts. And finally, this French nécessaire dates from 1775-1800 and is made of shagreen on wood; gold, porcelain, glass, and steel fittings. This portable nécessaire holds numerous personal grooming items, from tweezers and an ear spoon to scent bottles.